Mummy was out at work today so I had to make lunch for the family. Here’s a great one-dish meal to have with fresh bread or rice. Put the oil and knob of butter into a hot wok. TIP! This is to prevent the butter from burning to brown. Add the onion and green pepper, and fry till they start to shrivel a little. Toss in the carrot and potato. Together with the garlic and chilli, wine and stock, get the minced beef in. Add the dark soy sauce too. Season generously with freshly ground black pepper, and just a little salt, according to taste. Don’t forget the pinch of dried oregano. Bring to a boil, place a lid on top and lower the heat to a simmer. Let it stay on the stove for 15 minutes, checking every 5 minutes or so that it doesn’t dry up. If it’s too dry for your liking, add water in small quantities till you get the consistency you want. Be sure to add salt if necessary. Serve with fresh coriander leaves on top. 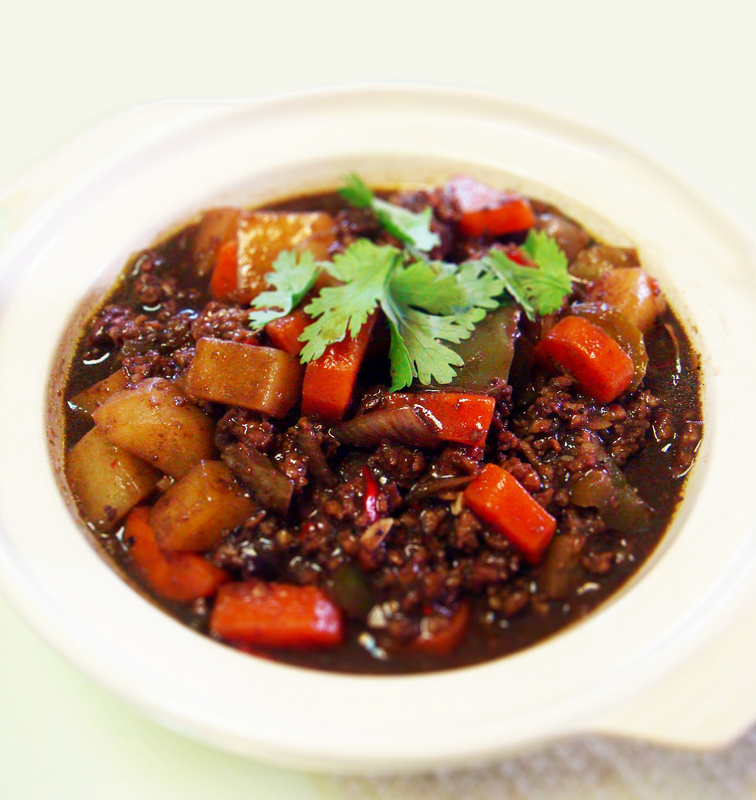 This entry was posted on Tuesday, August 23rd, 2011 at 06:40	and tagged with Beef, Carrots, Garlic, Onions, Oregano, Potatoes, Red Wine, Stew, Tips and posted in Beef, Tips and Tricks. You can follow any responses to this entry through the RSS 2.0 feed.